Pamommy Loves to Run: Pro Compression Review and Giveaway!!! Compression socks..... do they work??? I'm a therapist and we have been using them with our population for years for improving blood flow and assisting with fluid management. It only makes sense that the running world would jump into this area, and have they ever!! I've seen a ton of different socks out there, every color you could imagine, all promising to assist with either running or recovery. I was interested in the running aspect of the socks, not the recovery....yet! So here's the science behind the socks and then I'll get into why I loved them!! 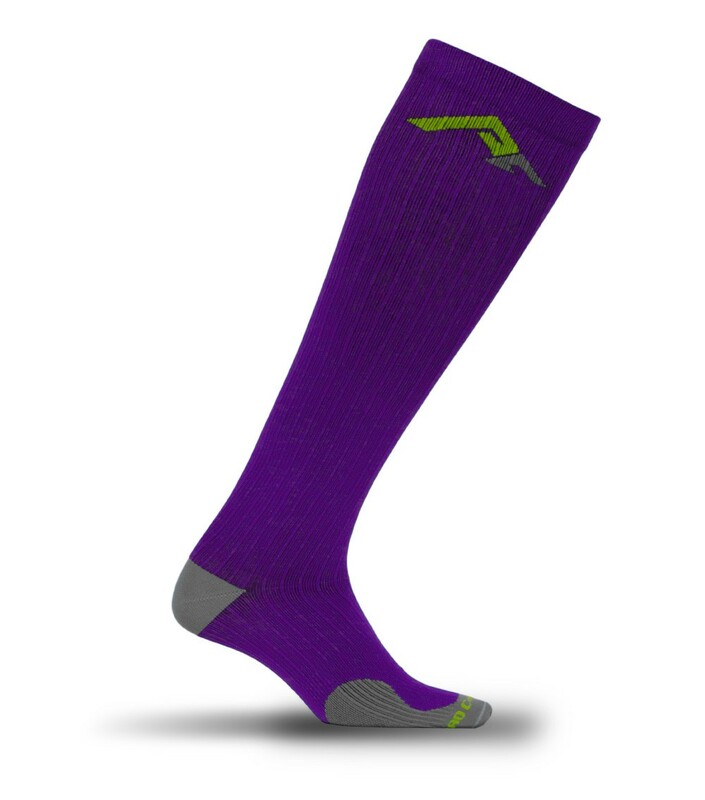 PRO Compression socks are designed specifically to deliver both maximum comfort and speedy recovery times. The science is complex, but benefits such as improved blood flow, stability and comfort are universally understood. The moment you put these socks on your feet and incorporate them into your game, you will feel and understand the difference. PRO Compression socks are noticeably tight and require more effort to put on than standard socks in your drawer. But it’s that extra effort and much-needed compression that make all the difference. Be patient and your feet will thank you. PRO Compression socks are the result of years of innovation. We started off with a unique design, used by endurance athletes for years, and added golf-specific enhancements for maximum comfort and performance. This sock was designed to keep you ahead of the competition. A better footwear choice is simply not available. Our world-class design is complimented with specialized materials. Without them, it would be impossible to create revolutionary performance footwear. Cotton and wool simply aren’t going to cut it in a world where the best athletes rely on the highest-quality gear. PRO Compression uses a proprietary blend of nylon and poly materials, optimized for performance, benefiting both amateur and professional athletes. All socks are designed and manufactured in the USA, giving PRO Compression complete control over the quality of every sock we sell, from design through manufacturing and distribution. Our goal is to deliver a world-class sock that will enable you to play better than ever and recover more quickly than previously possible. We’re confident you’ll feel these improvements immediately. Here's a picture of the beauties that I got. I've been crushing on the purple socks for a while and guess what color they sent me to review......PURPLE!!!! I wore them out on my long run yesterday morning. I do my longs around 5am in the summer as the heat and humidity can take you from a 7 mile run to a 2 mile run quickly!! Let me say this about my long runs, I run a 2.2 mile loop around my neighborhood, I hydrate every 2 miles and Gu at laps 1 and 2 (half packet each lap) and then just hydrate for the last 3-4 miles. I hydrated well the day/night before and was ready for the run. The temps at the start were 76 with a heat index of 82 at 90% humidity. I started out good, but by mile 4 I knew I was dehydrating quick. Now in the past, my calves are the ones to go first.... this did not happen. My quads went. That being said, I think a lot of that has to do with the marathon socks. I'm going to wear them the rest of the summer on my longs and will get back. My mileage is going to be picking up significantly because half training kicks in in 2 weeks!!! Long story short..... I love them. They saved my calves on my long run and I'm going to keep wearing them. Check them out at Pro Compression or on Facebook or on twitter at @procompression. They have socks, sleeves, and full marathon socks to choose from and I love their current Sock of the Month. The folks over at Pro Compression were kind enough to offer me a pair to giveaway to introduce to my readers. Easy peasy lemon squeezy rafflecopter!!! If you can't wait enter JULY at checkout for 40% off your socks plus free shipping!! I have 2 pair of their socks & one pair of calf sleeves...love them. Would like a pair of black or white socks because they'll go with anything...also like the pink argyle. I've never tried the sleeves but my husband loves them!! I NEED the argyle ones! I've never tried Pro Compression, but I would love to give them a try after my long runs! I'd pick the hot pink ones for sure. I have the hot pink ones, LOVE them! I have never tried them but I love the neon green with pink stars! I was just drooling over them when I came across this giveaway! I love socks, I have to match my running outfits up to all my socks!! Good luck! I have been dying to try these and would love some purple ones!! I love my purple ones and I have pink too! Thanks for the entry! I've never tried pro-compression, I'd choose marathon purple. Good choice! You will love them if you win, if not take advantage of the 40% off!! Yellow is on my list, especially for my night runs! Anything to brighten me up so I don't get hit by a car! I like Pro Compression. I have tried others and tend to make my way back to them all the time. Good luck! I would like the orange or the lime in preference! Although I could wear the black ones to work easily for recovery. I haven't used them for recovery yet. Looking forward to a long that I will need them for! I've never tried compression socks but have been wanting to try them. I'd have to go with Marathon Pink! I have the pink and LOVE them!! I love Pro Compression! I really want the red marathon socks! Red.... I think I could buy something to match that. Good luck! I love compression but have never tried pro compression. I would be tempted by purple but would probably go with Marathon Pink! Either color is a great choice. Which brands do you use? LOVE procompression! I want the powder blue or the Pink Argyle! The argyles are next on my list to get!! I love those. They remind me of 70s basketball! Good luck! I have not tried Pro Compression. I'm using another brand right now and would love to be able to compare the two. I would like the white because then they go with anything. What brand are you using? I've tried a few different ones too but I LOVE Pro! I'd really want the black sleeves! I've never worn the sleeves, friends of mine Love them! Ooh Marathon Lime or Neon Green. I've been wanting to try compression socks/sleeves for a while now. I tried to get those, they are tough to get! Sold out in my size right now! I also like the purple. Or the retro. I have tried these! I had some neon green sleeves- that recently had to be trashed after washing in the machine and drying. I know better, I do. lol I love the purple! I had the same trouble. Learned my lesson, washing machine.. yes, dryer.... NO!! Would love to win these and try them out!!! You would love them!! Good luck! Yes! I love ProCompression! I have 3 pairs already. They work wonders for my shins and I'll never stop wearing them! I like the new limited edition lime green with pink stars design! LOVE the lime green with pink stars, they were sold out but I will eventually get to them!! Love ProCompression. I have 2 pairs so far. I would really like the purple pair. Love my new purple ones! Good Luck!! LOVE my ProCompression socks! I live in them year round for recovery and with being on my feet all day at work. I'd choose the argyle pink.